As Super Bowl XLIX gets closer, die-hard football fans everywhere are in search of the best game day recipes. 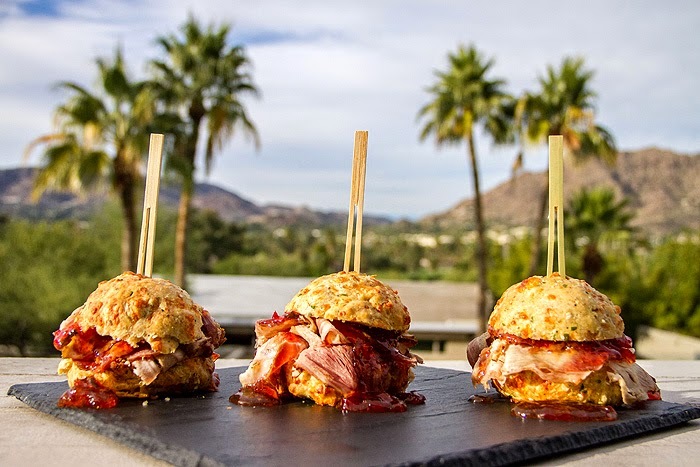 Executive Chef Beau MacMillan of Arizona’s Sanctuary on Camelback Mountain, shared with me one of his favorite recipes, Ham and Jam Sliders. A step up from what is usually served on Super Bowl Sunday, these bit size fresh ham sliders are served on homemade cheddar biscuits and topped with a tangy red pepper jam. Both that pepper jelly and those gorgeous biscuits have me salivating! What fantastic sliders for Super Bowl Sunday. Oh wow, these sliders looks delicious!! Love the salty-sweet-spicy flavor combo you (and Chef Mac) have going on in this sandwich! OH dear me. This is something I would luxuriate over eating, while getting it all over my face. Love it. I love these....I have just the gluten free buns to use to make this! I pinned these to several different boards yesterday, and still haven't stopped thinking about how amazing they look! I NEED to make a batch of these biscuits and the jam...so I can have the sliders. yummmm. Now if we had those I'd probably be a lot more into Super Bowl Sunday! Your cheddar biscuits look amazing! Pinning so make these later! Yum, and SU too! Good God I'm drooling for these sliders and it's only 10 am here in Rome! Whoa these slides look awesome. It's the perfect combo of sweet and savory. I am SO all over this! Oh-my-lawd! !